Small shrub with creeping branching stolons and erect stems. Large rounded green leaves. 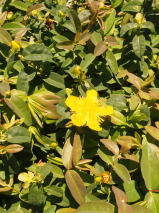 Large bright yellow flowers through the summer. Incredibly tough ground cover. Will thrive under trees or in dry hostile places, though flowers best given some sunshine. Can tend to be invasive given good growing conditions, but great for filling a small contained garden. Hardy.